This article is a guest translation by megax, a good friend of ours. Please thank him for his dedication to spreading production insight through the western fandom! -Please tell us your feelings when it was decided to make a Sound! 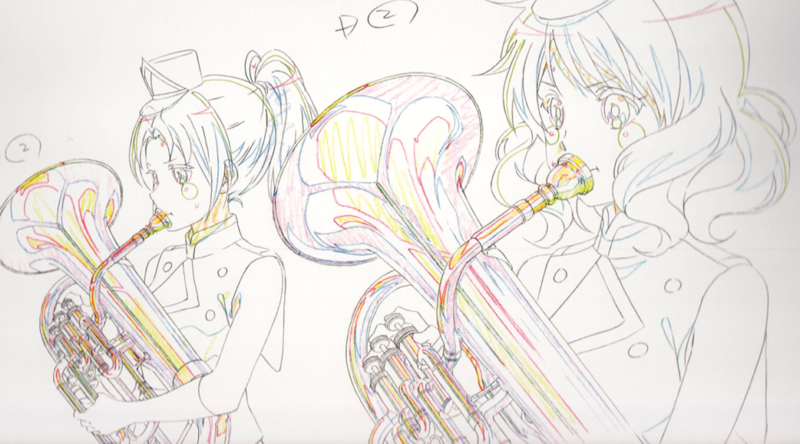 Euphonium movie. Ikeda: We felt that those who had seen the TV series would be able to enjoy themselves again while watching the film, but also that a movie would be certainly a good medium for those who weren’t aware of the TV series to enjoy this musical/adolescence story. Ishihara: It would certainly be a great chance for many different people to see the story. Yamada: Also, we were happy that people could enjoy the performance scenes with the acoustics of a movie theatre. Ishihara: The movie has a certain power to it that makes you feel like there’s really a performance in front of you if you close your eyes. Since we have sounds included in the 5.1 surround mix for the movie, we made them have a certain “oopmh” to them. Ikeda: That’s something you can genuinely look forward to! -What was the response inside the studio like to the news? Yamada: And as was rumored, most of the new cuts this time were performance scenes like the full version of “RYDEEN”. With flowers all around the marching drum and color guard cuts making them look so cool, your excitement levels will surely rise once you see it! -Who drew the storyboards for the new scenes? Ishihara: Most of the performance scenes’ storyboards were drawn by Yamada. I was in charge of the other scenes and the performance at the beginning. Ishihara: Did I do that? Yamada: Since he had his focus on his pencil, I read his thoughts and asked “then would you like me to draw the performance scenes?” I had a certain desire to want to draw them as I had some “homework” left over from the concert. Ishihara: Ah, you did, didn’t you? Ishihara: This wasn’t well-known, but…. there are some points in the performance of “Crescent Moon Dance” in the TV series’ final episode where there’s no musical cuts inserted. There was a portion that was just used as background music in the TV series. Ishihara: And with our fine-tuning not working, we were left to abandon it…. Ikeda: Is that true? (laughs) Well, I was filled with emotion again with these performance scenes in the film, Yamada-san. Yamada: I feel lots of gratitude for that! -Please talk a little about the additional scenes that weren’t performances. Ishihara: The conversation scene with Yuuko and Mizore (Yoroizuka), right? Mizore appearing is somewhat fanservice. Mizore appears in the second novel, so we knew of her while we made the TV series. Since we didn’t know what would happen with the anime afterwards, we didn’t have her talk. As season 2 had already been determined when we were making the movie, we could use her appearance in it as a bit of foreshadowing towards that sequel. They were originally close friends, so you see bits and pieces of that friendship through the TV series, but I thought it would be nice to add a scene with just the two of them in this movie. Yamada: She speaks for the first time in the film, right? Up until now, she’d be shown on screen, but have no dialogue. Also, she’s so cute in the commemorative photo taken with the entire group that was shown in the final episode! Yamada: The nuance is different now. Ishihara: When Reina says “Are you asking me to lose on purpose?” we added another cut that has “Yuuko shocked”. -Were there any difficult points trying to integrate all 13 episodes of the TV series? Ishihara: Since we used Kumiko and Reina as the focal points for how things were brought together, there are some characters that you wouldn’t get to see. Personally, I’m disappointed that we couldn’t insert Natsuki’s story. Yamada: Aoi’s story was also not included. Ishihara: If we included everything, then the main story would be hidden. If we had to make this into one singular story, then we had to show everything centered around Kumiko and Reina. The one thing we couldn’t remove at all costs was Mt. Daikichi. Yamada: I think if you choose a different route than that of Mt. Daikichi, then the focus of Kumiko’s story changes. –By “route,” you mean like a branching point of a game? Yamada: Right. I believe you could have around three routes with her by going with Asuka’s route or the route where she’s inspired by Taki-sensei like the group as a whole to play. But regardless, (director Ishihara) chose “Reina”, didn’t he? Ishihara: Reina was chosen because she had the biggest influence on Kumiko’s growth. Ikeda: It also ties together the first episode and the last one. -Of course the story’s focus is around Kumiko and Reina, but all of the members of the North Uji Wind Music Band have characteristic personalities. Which member stood out as being more entertaining than you expected? Ishihara: The one that was the most entertaining has to be the horn player Lala Hitomi, right? (laughs) She has a spinoff in the drama CD. Yamada: The scene (in episode 10) where Kaori reprimands her was so cute. She looks so dejected. -The male characters also stand out too. Ikeda: Though the saxophonist Chikao (Takigawa) doesn’t appear much, he has considerable presence when he does. Yamada: He’s in a sweet spot as you get to see him and Shuichi going home together. 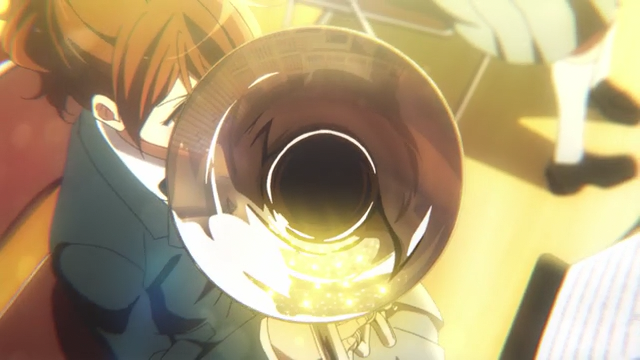 Conversely, you don’t get to see (Jyuuichi) Takino-kun (trumpet) at all. Ikeda: His image in the bunch of twitter icons (on the official site) is so pitiful. (laughs) At the time they were distributing them, there were no images of him that had a bigger impact….. Also, Ishihara-san keeps talking about the two percussionists, Knuckle (Meira Tanabe) and Saki Kayama. -Ikeda-san, were there any secrets in the designs when you were creating them? Ikeda: They don’t appear like it on the outside, but there’s actually a couple of characters who I’d go out with. Yamada: They’re quite attractive. I’m surprised Ikeda-san so nonchalantly included them. Now that I know her preferences, it makes those illustrations and other images she drew more interesting. Ikeda: You’re reading too much into the backstory. (laughs) It’d make me happy if you thought “so this would mean what?” when looking at an illustration. -There’s a lot of strong willed members in the horn section. Yamada: Also, the two bassoonists, Raina Kitamura and Kino Okami, have a bit of a nice contrast in their characters. They don’t feel like bassoonists. Yamada: Bassoons have that soft, warm sound but those two feel like they’d match that flashy, showy sax style more, don’t they? Ishihara: Ah, I see what you mean! Yamada: So the bassoonists have that contrast moe! Ikeda: You sound so delighted. Nevertheless, the illustrations for the inside digipaks of the disc releases were quite difficult. Yamada: Thank you for your hard work! They’re truly worth seeing. I want a lot of people to take a look at them. -You re-recorded the dialogue for the movie. What changes, like in the atmosphere of the recording booth, did you see in comparison to the TV series? Ishihara: Sound director (Yota) Tsuruoka-san’s thorough direction came out. Each time it felt like “wouldn’t it be nice if it didn’t feel like an anime here?”. The TV series has a turning point in each episode so the emotions have to be phrased according to that, but since a movie is focused around one story, there were many times where the modulation of character voices had to be restrained compared to the TV series’ version. -How was the atmosphere of the cast? Yamada: There were a lot of people, so we welcomed those who had experience with wind music. They were willing to educate we commoners about the subject. It was great to get live feedback on things like specific pronunciations. -What kanji character would you say represents Sound! Euphonium? The novel writes about adolescence as something that’s not simply a fun experience. It’s full of disagreeable things. But in that time period, there are some good things that you can be passionate about. Anything you’re passionate about is good. Don’t put that overwhelming energy into storage instead of using it; it’s important that you allocate that to something. Yamada: You’re not able to do things like “not caring about how you look” as an adult either. Ikeda: You have a certain way of doing things when you’re an adult. Ishihara: That reminds me, I also rode down staircases on my bike. No real meaning behind it. (laughs). But that was a fun time. Yamada: There’s a lot of new things as a high school student! Ikeda: “Life”! Lumping together moments like when you try your best or when you think about others, all of those life moments are very enthusiastic. Yamada: “Living” doesn’t just mean the happy things in life too. Ikeda: Right. It’s those moments where you do your best to live or else you feel like you’ll regret it, or feel like you failed for the rest of your life. Yamada: I think there’s a lot of moments like that which do nothing but worry people. Ikeda: Yep. But surely good things happen if you don’t give up there and stick it out. Also, main characters aren’t just in anime, each “society” is built up of them as well. In this work, by accurately depicting the many members, you can somewhat expand their own “society.” It’s possible to say “this is everything for the characters,” but even though you’ve restricted it to “club activities,” the various people there each have their own thoughts and you can depict that. It’s nice. Ishihara: It’s very small compared to real society and yet it’s the best they can do as students. Yamada: If there’s a problem that arises that doesn’t affect me, then I’ll depict to that. I think tying it to that reality is one of the charms of this work. -What character for you Yamada-san? Ishihara: Ah, I get it! I was thinking about “breaths” myself. Yamada: But it could also be “lungs” too. (laughs) My first approach to this work was “breaths and “breathing.” When I thought about how to represent that, it became “pipes.” Each of us inside have a pipe (trachea), so it’s a “pipe” that connects us all. -Finally, please leave a message for all the fans who chose to see the movie. Ikeda: “Thank you so much! Please enjoy the movie and then enjoy the sequel!” is all I can say. Yamada: While thinking how wonderful music is, all of us on the production side saw again how it’s something precious that everyone feels. While being a passionate series that crosses generations, I wanted this movie to also be something people would realize anew: it’s nice to have someone’s core stay the same. Thank you so much for giving us your support! Ishihara: I feel we’ve refined the music and squeezed the theme of the highlights enough that the story itself is easier to understand when it’s shown in the theatre. I think you’ll enjoy the worldview of Sound! Euphonium. Wow. Great roundtable there. Getting me much more hyped for season 2 (And of course, for the movie since I haven’t seen it yet). One thing that stood out to me was that they actually seem to care about pronunciation. One of my biggest complaints of dubs is so many of them don’t even seem to spend 5 minutes making sure things are pronounced properly. Peeves me. Sounds like quite the undertaking. haha I will definitely look forward to them. How much thought they all, especially Yamada, put into where each of these characters is going makes me really confident in season 2 of Eupho. I can’t say I would be as excited for more of that story if it wasn’t in the hands of such great creators. I love roundtable, it’s better than interview because it seems they are more free to talk. Thanks for the translation, hope we get to see more.